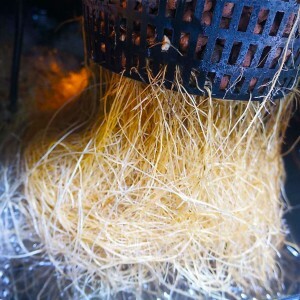 DWC marijuana roots are awesome! In our first article revealing the insider secrets of deep water culture (DWC) you read that DWC supercharges your marijuana plants for faster growth, more potency, and heavier harvests. We got questions from people who’ve never used DWC, and from growers using DWC who want to better tune their systems. The first thing is to again explain: at its most basic, a marijuana deep water culture system is an opaque bucket, an opaque lid for the bucket, a net pot, and some form of aeration device placed in nutrients-enriched water that partially fills each bucket. The lid has a cut-out to anchor the marijuana plant. The net pot and the lid together hold the plant in place. 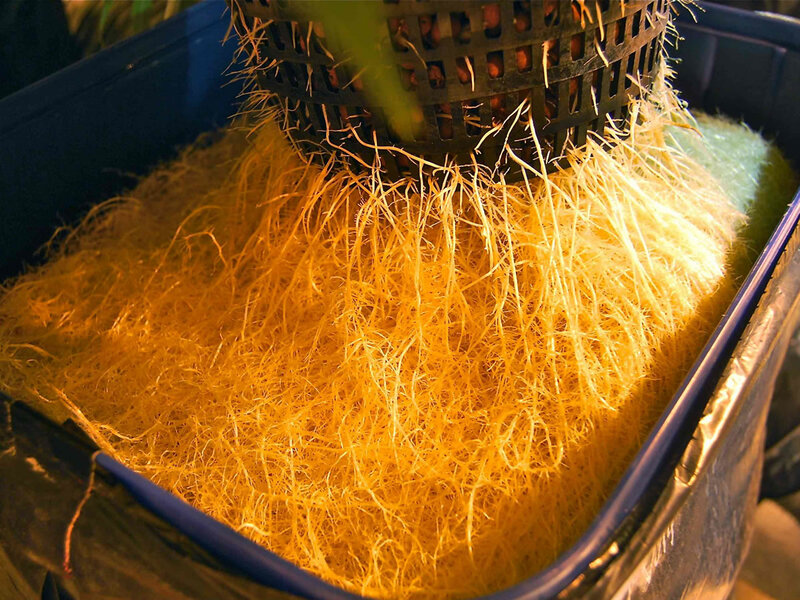 A DWC system can consist of individual stand-alone buckets, but by far the most common use of DWC is in modular systems with several buckets connected by tubing and linked by a common nutrients water reservoir. In some situations, a grower might put hydroton, perlite, or some other totally inert media into the net pot to help with anchoring. Another reason some marijuana growers put inert media into their net pots is to provide an environment for beneficial microbes. 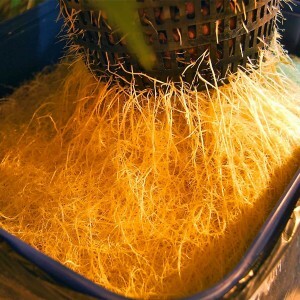 In many types of soil and soilless marijuana gardens, growers use products such as Voodoo Juice, Tarantula, and Piranha to install root zone beneficial bacteria and fungi species that protect, energize, and assist marijuana roots. Marijuana cultivation guru Michael Straumietis says there are arguments for and against using beneficial microbes in deep water culture and other pure hydroponics systems. He notes that if there’s no root zone media at all, beneficial microbes have a hard time colonizing the root zone. If the cannabis grower isn’t using chillers, reverse osmosis, aeration and other tactics to closely control their nutrients water, adding beneficial microbes can create messy situations that degrade root zone health. In properly-tuned DWC systems, the oxygenation, temperature, nutrients absorption, and root health of your cannabis plants are well optimized that beneficial microbes might not create significant enough advantages to justify their use. Straumietis warns that high nutrients water temperature (above 70F) creates a situation in which beneficial microbes might become non-beneficial. Another issue marijuana growers ask about regarding DWC is a topic that’s very close to Straumietis, whose company Advanced Nutrients is the only one manufacturing hydroponics nutrients specifically for marijuana’s unique nutritional needs. Straumietis explains that his company’s hydroponics base nutrients are called “pH Perfect” because they automatically balance and hold root zone pH at 5.7. Nutrients water temperature, parts per million, and reservoir maintenance are key elements in running successful deep water culture grow ops, Straumietis says. He emphasizes that a water chiller is a required component for deep water culture marijuana gardening because the ideal water temperature for hydroponics oxygenation and nutrients absorption is 67-68 degrees Fahrenheit. “Your plants grow best in a grow room that’s 73-75 degrees Fahrenheit, or warmer if you’re adding CO2. If you don’t have a chiller, your nutrients water will be the same as your air temperature. Nutrients water higher than 70F may lack adequate oxygen-holding capacity, and nutrients water above 71 lacks oxygenation capacity and also provides a breeding ground for harmful organisms that rot marijuana roots,” Straumietis explains. Deep water culture marijuana growers should carefully monitor their plants’ leaves for signs of nutrients burn or underfeeding, he says. “Depending on what marijuana strains you’re growing, and what brand of nutrients you’re using, the right parts per million might be significantly more or less nutrients dosage than the manufacturer recommends. I recommend going under recommended dosage because this leaves room in the solution for more oxygenation,” Straumietis explains. This is the second in our series on deep water culture marijuana growing. Come back for article number three, and get more insight into pushing DWC to the limits of maximum growth and yield.